RTE News video interview with Jamie prior to the Cork v Kilkenny challenge senior hurling game in aid of 'FriendsOfJamieWall'. On Saturday 25th April at 7pm, Cork senior hurlers will meet Kilkenny in a challenge game in Pairc ui Rinn in aid of the 'Friends of Jamie Wall' fund. Tickets will be on sale in the coming week through Supervalu & Centra stores across Munster. A full list of stores selling tickets can be viewed on the Friends Of Jamie Wall website. Tickets will also be on sale online through tickets.ie and at the turnstiles on the night. Tickets are €10 for adults and €5 for U16's. Jamie's incredible story has had an effect on Arsenal and England midfielder Jack Wilshere as seen in this wonderful message of support. Every year Na Piarsaigh Hurling and Football organise relay teams for the Cork City Marathon. They select a charity/ fundraising group every year. This year they have selected the Friends of Jamie Wall Trust for the Marathon on 1st June 2015. . Each entrant pays €20 registration to enter the marathon relay teams. Walkers , joggers and runners are all welcome. Teams of 5 are then organised by the club. Each team will have a captain who will liaise with the club for gear pick up etc. Each participant will then receive a sponsorship card for the marathon. The proceeds of this sponsorship card will be divided evenly between the club and The Friends of Jamie. You may enter individually and they will organise you in a team or you may enter as a team. A registration night will be held in the club on 1st April at 8 pm. Friends of Jamie Trust will be in attendance as will all of the Na Piarsaigh Fundraising committee. On the day of the marathon a bag drop facility , transport to Cork City and changing / shower facilities can be arranged if there is a demand. Jamie’s mother is a native of Cullen and his grandparents are originally from Rathmore and Gneeveguilla and therefore members of Cullen GAA (Cork). Underage hurling and football training sessions for your club with an inter county star and lots more. The Cork minor football squad travelled to Kilbrittain and took part in a training session prior to the run. They made a donation to the fund and presented Jamie with a cheque. Well done to all who took part and to those who organised the Jog4Jamie on Sunday 15th March. with 540 official participants it was a great occasion and an enjoyable event for all who took part. Jamie was present himself to start the proceedings and he also accepted the donation from the Cork Minor football squad. Denis Ryan was the first man past the line in 23.53 2nd, Paddy Murphy 24.07 and 3rd., Paul Holland 24.15. Claire Sutton was the first woman home in 29.14, with Anne McCarthy 2nd at 29.23, and Theresa Barnett was 3rd with 29.56. The full list of results can be seen on the friendsofjamiewall website. 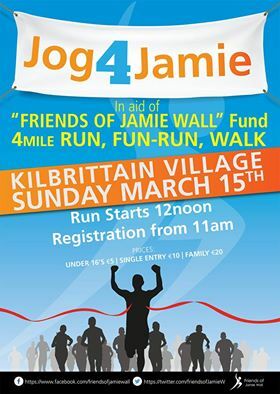 Best of luck to all taking part in 'Jog4Jamie' in Kilbrittain Village on Sunday 15th March with all proceeds going to 'Friends of Jamie Wall'. 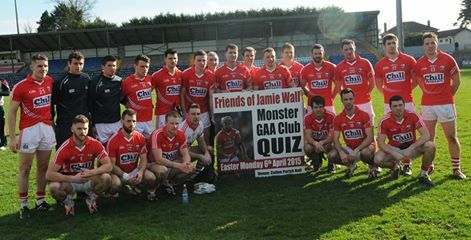 A raffle held on Saturday night during the Club Social raised €1,015 for 'The friends of Jamie Wall' fund. The raffle prize winners were 1st Con Healy, 2nd Mary Burke, 3rd Denis Ryan. The club would like to thank Dan O'Connell Owen Sexton and Paddy Ryan for the kind donation of prizes! Dan donated a 'blood stained' cork jersey worn by himself during his cork playing days and Owen donated a 'Hamilton High school' jersey worn by himself during his successful playing days with the school. Both 'historical' items! Paddy donated a new pair of Mikasa football gloves! 'Friends of Jamie Wall' are holding a 4mile fun run/walk, 'Jog4Jamie' in Kilbrittain Village on Sunday 15th March with all proceeds going to 'Friends of Jamie Wall'. Bandon GAA and Under-age GAA are holding a Table Quiz in The GAA Pavillion Bandon on Friday 30th January at 8:30pm with all proceeds going to The Friends of Jamie Wall. Tables of 4 for €40. A presentation was made to Micheal Wall on Friday 2nd January 2015 of the proceeds of the annual Puc Fada. A cheque for €1,100 was presented to Micheal by Chairman Kevin Kingston and Treasurer Denis Ryan. Micheal accepted the cheque on behalf of 'Friends of Jamie Wall' trust and expressed his gratitude to the club while also acknowledging the separate fundraising of Kilbrittain bowling club over the new year. The presentation was made in 'The Amber Bar'. Great to see the Clubs supporting the Friends of Jamie Wall Trust. Thanks to all, have a Great Christmas and see you at the events. 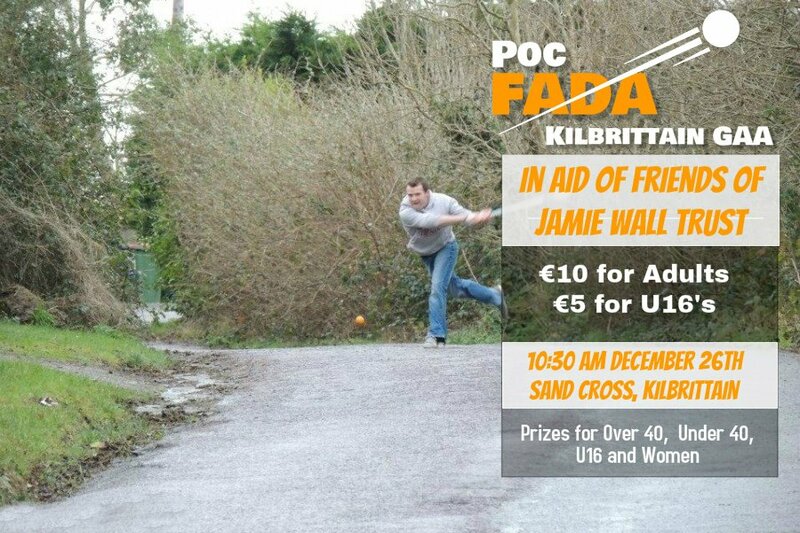 The annual Poc Fada this year will be in aid of Friends of Jamie Wall. It takes place on December 26th St Stephens Day starting from Sands Cross at 10:30am. All are welcome. See events diary for more details. Kinsale Triathlon Club were delighted to be able to hand over a cheque for €7508 to the Friends Of Jamie Wall Trust following the Santa Dash on Sunday 14th December. An account has been set up by 'Friends of Jamie Wall' anyone wishing to donate can do so with the following information. Anyone who would like to take part are asked to fill in an application form available in Kilbrittain Post Office and from Lemon Leaf Café Kinsale and O'Sullivans Pharmacy Kinsale or from kinsalesantadash@gmail.com, as soon as possible as they need to know numbers for insurance purposes. Just a quick message to say thanks for signing up. Great to see so many people making a real contribution to the spinal research that could prove so important to me and countless others. I'll be wheeling the 5k in Dublin so I'm hoping I might catch a few times!!! Le gach dea guí, Jamie.